Looking for something a little bit cooler than your normal toilet seat? 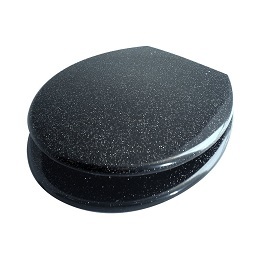 Most people go with a white or a wood effect toilet seat but this black glitter design is certainly up there in terms of more fancy looks and feels! Everybody likes to design the toilet a little bit different and white & black contrasts are common, so this makes the perfect ally for anybody going down that route of design. At such a fair price you are getting a pretty decent calibre of toilet seat that comes with universal fittings so you can use it for pretty much any toilet seat unless you are going with something extra special as your base for your toilet! The heavyweight resin seat will be able to take even the largest of impacts so you don’t need to worry about wear and tear after it bangs up and down after every usage! This is the perfect toilet seat for somebody who requires something a little bit more inspiring than your traditional toilet seat. The hinges are adjustable lengths, too, so you shouldn’t have too much trouble in making it fit your toilet – basically, this is the right decision for you if you want a real quality of toilet seat that is going to be suitable for you with a little bit class and magic about it.